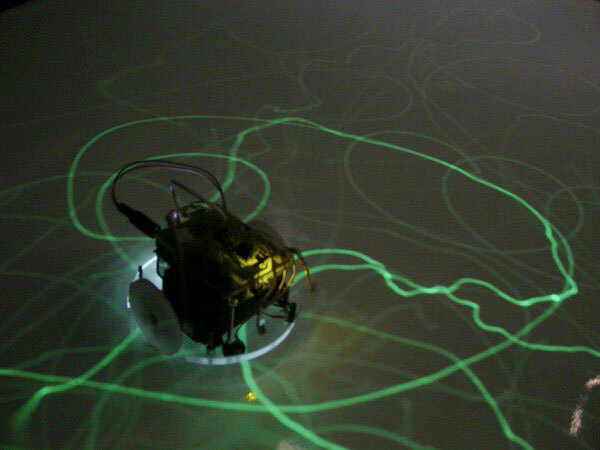 Christian Cerrito is experimenting with robots that react on their surrounding environment. So far this is nothing special, but what´s new is that they create real world output. His small robotsdraw lines. One of his robot setup reacts on shadows, so when there is a person standing in the light, the robot starts to move along the shadow outline retracing it. Though it is just an exploration paper, it is possible to imagine a broader use of it, for example making long term art pieces using light and passers-by. Another bot of him reacts on sound and escapes the noise source. What drives Christian is the question on how technology reacts to real world creates something “aesthetic” that can be percepted as art. We recorded an interview with him on his project that is right in the editing. Come here back soon to have a look at! This project leads me to display some other quite interesting robotic drawings machines I know. The first is by Mey Lean Kronemann, a BA Student at the University for Applied Sciences in Potsdam Germany. While the last summer term she was guest to one of my courses that dealed with swarm aesthetics. Together with Philipp Urbanz and Ferdinand Leneis she created Pherobots, little bots that are similiar in shape to the ones of Christian Cerrito. The main difference is that they do not trace a coloured stroke with a clipped in pen, but used a LED pointing on wide surface of glow in the dark foil. The Pherobot is detecting the brightest light source and moves straight towards it. Because there are more than one bots on the surface, the bots follow each others light trace on the glow in the dark foil. The result is bright “street” on which the bots started to move along, just because it´s becomes most attractive e.g. bright. Copyright © 2007 TUI Blog by form+zweck. All rights reserved.